Every now and then a revolutionary artist comes along who is the ultimate rebel in every way, shape and form – this statement is perfectly embodied by American artist extraordinaire Ron English. English is much more than an artist, he is someone who has taken American consumerism to an entirely different level. He has incorporated branding and advertising elements into the art world and given them an identity of their own. As an artist English clearly states that he is on a mission to bring back art into the American life style, and it’s not just an elitist hobby anymore. For him art is to be enjoyed and appreciated universally. It was English who gave rise to the term ‘POPaganda’ in art, for him anything which could be touched or felt is a form of art. English is one of those rare breeds of artists who dares to be different, so different that he often gets himself into trouble with the authorities for using public billboards and walls for his works. He is that artist who would mesh iconic images of Leonardo da Vinci and Vincent Van Gogh with images of Homer Simpson and McDonalds – in simple terms very pop culture driven images. 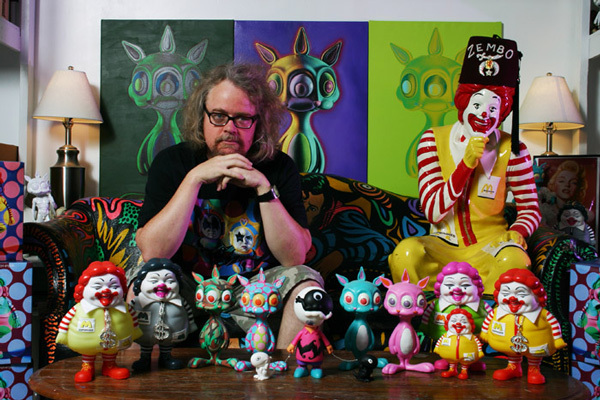 Ron English was born in 1966 in Dallas, Texas and today still refers to Dallas as his home. Today he is considered to be one of the most influential and charismatic artists alive and is hailed by many as the father of modern contemporary art. English’s unique style uses a mixture of bright, high and low cultural iconic images along with a strong dose of comic book heroes and blending them with mythological and historic figures. It is no wonder he is an artist whose work will feature the likes of Marilyn Monroe and Venus in the same capacity. In many ways English creates a world of artistic evolution in his paintings – he paints, sculpts, writes, designs album and book covers and is also a graphic designer. All his talents can’t take away the fact that English also happens to be a bit of a trouble maker for corporate organisations. Many of them have come under fire by English in his works – he has boldly attacked McDonalds, Trump Towers and the war on Iraq in his works. English doesn’t shy away from political sentiments when it comes to his work, if he is unhappy with something or someone he will gladly manifest it into his work and showcase it for the whole world to see. He may draw ire from corporations and the political world but he continues to win deep admiration from people around the world. English literally exploded on the global scene with his unforgettable images on the walls, streets, museums, movies, books and grocery stores of all places as well. Some of his most iconic imagery includes the obese McDonald’s mascot he designed for the Oscar nominated documentary Super Size Me. Another masterpiece which graced the streets of New York was the Abraham Obama portrait which was a mesh up of the 16th and 144th Presidents of America. Ron English is simply fearless when it comes to being an artist and an icon for many across the world.